The plastic injection molding process has been around in various and increasingly sophisticated forms since the mid-19th century. 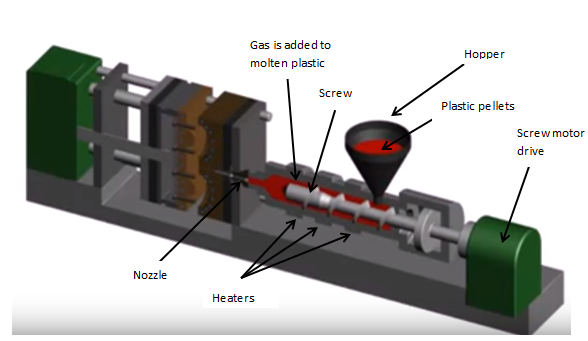 The technique of heating the plastic and melting the molten substance into a desired shape is at the heart of the plastic injection molding process. Plastic molding today is considerably different from the rudimentary operations of yesteryear. There have been many advancements. Indeed, by WWII, injection molding became of major import in the creation of medical equipment and the effort to keep up the pace brought scale and innovation to the manufacturing process. While the concept remains unchanged, much of the equipment used in the plastic injection molding process has evolved considerably. The use of computer technology, in particular, has revolutionized development and the rate of production has been greatly increased. Additionally, innovative computer software has made it possible to manufacture products that were previously avoided to due to their complicated and intricate shapes. Additionally, with an eye on keeping production costs at a minimum and a greater awareness of recycling methodology, the plastic injection molding process has become part of a thriving industry with numerous applications used in almost every aspect of everyday life. Some of the most common uses of plastic molding include products such as computer accessories, packaging, bottles, medical devices, automobile parts, fencing, toys, appliances, furniture, mobile phones and windows. With the environmental impact of the world’s reliance on plastics, recycling has become a major component of the plastic injection molding process. While the bad news for some is that disposing of plastic is a major concern, the good news is that virtually every day new techniques and methods are being developed to deal with the overflow in productive and environmentally friendly ways. The future is bright – not only for the plastics industry, but for the planet as well.